Normas de seguridad estructural de edificaciones y obras de infraestructura para la República de Guatemala. This code was already implemented in CYPECAD and Metal 3D as of previous versions for use with the dynamic analysis method (spectral modal). 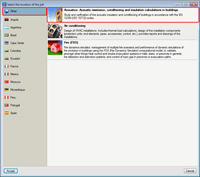 Users can select the analysis method (dynamic or static) using the Analysis method option within the dialogue box in which seismic action is defined. This correction is applies when the seismic design is carried out using the dynamic analysis method (spectral modal). Norme Tecniche per le Costruzioni (14 gennaio 2008) Paragrafo 3.2 Azione Sismica. This code was already implemented in CYPECAD and Metal 3D as of previous versions for use with the dynamic analysis method (spectral modal), which it proposes. A static analysis method (equivalent lateral force) is included in the 2013.e version of CYPECAD. Users can select the analysis method (dynamic or static) using the Analysis method option within the dialogue box in which seismic action is defined. A new tool: Strut3D, has been incorporated in the 2013.e version of CYPECAD, Metal 3D and Foundation elements. Strut 3D checks foundation pile caps using a general calculation method in which the D regions of the reinforcement are analysed using a strut and tie model, in order to guarantee the structural requirements are met in accordance with the standards. The strut and tie model used has been previously validated by a linear finite element analysis. Additionally, Strut3D provides a graphical output of the results, allowing users to consult them on screen and in the detailed verification reports, which indicate whether or not they comply with the standards. The information provided is of great importance, as it is this information which will be used by the project designer when deciding on and justifying the design. Strut3D is the result of a development project developed by CYPE with the collaboration of the 'Instituto de Ciencia y Tecnología del Hormigón' (ICITECH) of the 'Universidad Politécnica de Valencia' (UPV), financed by the 'Centro para el Desarrollo Tecnológico Industrial (CDTI) and co-financed by the European Regional Development Fund (ERDF). Therefore, Strut3D is a breakthrough compared to other products currently in the market, because it verifies and justifies compliance with the design standards based on an optimised strut and tie model in a simple and intuitive manner for its users. To access Strut3D in CYPECAD or Metal 3D, users must have a license providing access to version 2013.e or higher in either of these programs, and their Pile caps module. 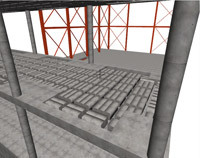 To access Strut3D in the Foundation elements program, users only require the program with version 2013.e or greater. The first version of Strut3D currently only considers the Spanish EHE-08 concrete design code. More concrete design codes will be implemented in upcoming program updates. More information on this CYPE program tool will be available shortly. The Acoustics tab of CYPECAD MEP analyses the acoustic insulation in accordance with EN 12354 and is available when users select a country which does not have a specific acoustic insulation design code or when the ‘Other’ option is selected from the list of countries. The magnitudes used for each type of acoustic calculation are defined in this tab (acoustic insulation for internal airborne noise, acoustic insulation for external airborne noise and impact noise level) and the types of precincts are established for the acoustic calculation. All this information practically defines the standards of any country. Automatically analyses the building, resolving all the possible calculations between acoustic emitter-receptor pairs. Provides detailed lists of each calculation that has been carried out and a detailed acoustic study of the complete building. Provides graphical information of the indirect transmissions and drawings indicating the worst case acoustic insulation points. Users must have the corresponding user license permits to be able to use the module for Acoustic insulation in accordance with EN 12354. More information on this new CYPECAD MEP module is available here: Acoustic insulation in accordance with EN 12354 (ISO 15712). 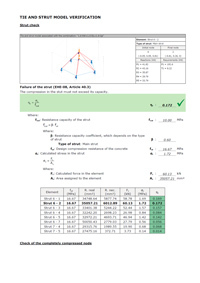 Improved edition of the resistant elements of the frames: reinforcement, steel sections, infills, trusses, connectors, etc. The new beam editor is currently available in CYPECAD for design in accordance with the Spanish EHE-08 concrete design code and Brazilian ABNT NBR 6118:2007 concrete design code. More concrete design codes will be implemented in upcoming program updates. CYPECAD, using its new beam editor, generates Detailed ultimate and serviceability (U.L.S. and E.L.S.) limit state check reports for concrete beams ( and buttons of the editor). In previous versions, the checks on the concrete beams were carried out internally by the program, but these were not indicated in the U.L.S. and E.L.S. reports. Now, the U.L.S. and E.L.S. reports that are generated also indicate the articles of the codes in accordance to which the checks refer to. More features of the beam editor are present in CYPECAD than in Continuous beams due to the torsional and seismic analysis performed by CYPECAD. The U.L.S. and E.L.S. reports provided in CYPECAD include checks for failure due to torsion in reinforced concrete beams (available for the Spanish EHE-08 and Brazilian ABNT NBR 6118:2007 concrete design codes, as well as all the other checks and the new beam editor) and also incorporates the specific checks of the design criteria for seismic loads for reinforced concrete beams (available when the selected concrete and seismic codes are the Spanish EHE-08 and NCSE 02 codes). The detailed U.L.S. and S.L.S. check reports for steel beams ( and buttons of the editor) and the steel beam series check ( button of the editor) are also obtained in the new beam editor (in previous versions, these were obtained using the Beam errors option in the Beams/Walls option in the Results tab). CYPECAD’s new beam reinforcement editor includes, as does Continuous beams, diagrams indicating the required and effective areas of the reinforcement provided in the edited frame. Bar bending diagrams of the longitudinal and transverse reinforcement of frames are included in the drawings of frames (depending on the selected code) belonging to jobs which can use CYPECAD’s new beam editor. The bar bending diagrams are also included in the Column detailing drawings. Design codes of diverse countries include capacity design criteria for seismic design of concrete beams and columns. These criteria aim to avoid fragile failure modes which can cause the structure to collapse due to mechanism formation. The capacity design criteria is based on increasing the bending resistance of the supports with respect to that of the beams, and increase the shear resistance of the columns and beams in proportion, improving the ductility of the structure. By applying these criteria, plastic failure is avoided at the supports rather than at the beams and shear (fragile) failure before failure due to bending, is also avoided. The tendency of the diverse codes, with regards to seismic construction, is to use these criteria by applying bending overresistance factors to the supports with respect to the beams, and shear overresitance factors with respect to the bending resistance for columns and beams. The 2013.e version of CYPECAD implements the capacity design criteria for bending at the supports in accordance with Annex 10 of the EHE-08 code. The remaining checks of the EHE-08 code and checks of other design codes will be implemented in upcoming program updates. As of the 2013.e version, the export to IFC format (Industry Foundation Classes) includes hollow core plates and lost forms of waffle slabs. These elements are not visible in the 3D view generated by CYPECAD but the hollow core plates are exported to IFC in three of the four available formats (IFC 2x3, Revit IFC 2x3, Allplan IFC 2x3) and the lost forms of waffle slabs to the four formats (IFC 2x3, Archicad IFC 2x3, Revit IFC 2x3, Allplan IFC 2x3). The option: Join reinforcement, has been implemented in the Longitudinal reinforcement dialogue box ( button), allowing users to join reinforcement bar packs of the same diameter. Users select two bar packs and indicate the amount of bars of these packs which are to be joined. Assigns the transverse assembly reinforcement to the selected stirrup span. Users can assign a different reinforcement type to that of the assembly reinforcement, to the selected stirrup span. The 2013.e version of CYPECAD MEP international has incorporated the design, check and detailing of duct air conditioning equipment. Furthermore, the sound immision of this equipment is provided in the Acoustics tab. CYPECAD MEP international is the version that is used when a country is selected for which the Price generator is not yet available or when the option Other is selected from the list of countries. The number of elements whose description can be edited has been increased (description type that was initiated in the 2011.a version). The 2013.e version allows users to define grilles and a wider range of ducts as elements that can be edited. Being able to edit the description implies that not only can elements and equipment from the Price generator be used, the project designer can also define the equipment parameter of any commercial trademark without having to import them from the Price generator. Furthermore, the editable description of the equipment and installation element allows for them to analysed and designed in CYPECAD MEP International. In Arquimedes, the Price structure of a database (bill of quantities or price bank) includes the quantity, the price and amount of a series of concepts up to a specific decomposition level. When this price structure reaches the last level (unit items), we refer to it as a Complete price structure. Until now, Arquimedes could only use one complete price structure in a price bank. In a bill of quantities, Arquimedes could use three complete price structures: Budget, Sale and Study price structures, but users could not view all three at once. The price calculation method option (Show > Configuration) indicated if the decomposition referred to the sale price or the study price. This way, a company can have its own price bank with the company’s expenses and the sale price for job units and unit concepts. These prices can be copied to a bill of quantities to become part of a chapter or job item, maintaining the company expenses and sale prices, and this way, obtain an offer for the developer. Users can use one, two or the three complete price structures in their price banks, depending on their requirements or what is customarily done when elaborating their bills of quantities. The Column presentation field within the Visible columns of the Decomposition tree dialogue box of a price bank (double click with the left mouse button on the header of a price bank in the Decomposition tree window) now has a new option: Company Price bank, which allows users to view the three complete price structures (Quantity, Price, Amount, Sale quantity, Sale price, Sale amount, Study quantity, Study price and Study amount). Since previous versions, bills of quantities created in Arquimedes contemplated three complete price structures (budget, sale and study), although only two of them could be visualised; the one we now refer to as the Budget (quantity, price or amount) and either of the other two (Sale or Study). The price calculation method option (Show > Configuration) indicated if the decomposition referred to the sale price or the study price. As of the 2013.e version, the three complete price structures, Budget (Quantity, Price and Amount), Sale (Sale quantity, Sale prices and Sale amount) and Study (Study quantity, Study price, Study amount) can be viewed at the same time and so, the previously mentioned, Calculation price method option, is no longer of any use and has been removed. These three complete price structures share the same decomposition structure. Usually, job items and auxiliary prices will only have yield or a quantity in one of the three structures (usually the Budget structure), unless the concept has been imported from a price bank or another bill of quantities that already had one of the other price structures included in it. For a concept to have data in any of the other price structures the desired yield or quantity (sale or study quantity) must be introduced in it together with its corresponding price (sale or study price). The three price structures allow for the project budget, study or objectives of the contractor and contract offer to be maintained in the same job, regardless of whether it is a public administration or private sector project. More information on the changes and new options, provided to our program users, to define the three complete price structures can be found below. New column features have been implemented in the Column presentation field within the Visible columns of the Decomposition tree dialogue box of a price bank (double click with the left mouse button on the header of a price bank in the Decomposition tree window) and other existing options have been improved. Some of these features have been adapted bearing in mind the options that have been selected in the Project type (Show > Configuration > Project type). These options are grouped in two categories: Project type (For Public Administration or For Private Promotion) and Price structure for the Job Execution Contract (New section implemented in the 2013.e version which contains the Budget price structure and Sale price structure options). Includes new columns implemented in the 2013.e version. Whether or not these columns appear depends on the options selected in the Project type dialogue box. Some of the columns it includes depend on the options selected in the Project type dialogue. Includes new columns implemented in the 2013.e version. As well as the two new column features implemented in the program (for price banks and for bills of quantities), new columns have also been added in the Visible columns of the Decomposition tree option (double click with the mouse on the header of a database – price bank or bill of quantities) which are used in the newly implemented and improved features. A new tool: Price structure (Processes > Price structure), has been created due to the new display of the three complete price structures in a bill of quantities and its implementation in a price bank, which allows for data to be transferred between these price structures and for them to be modified automatically. Copies the quantities and prices of one of the three price structures (Budget, Sale or Study) to another, with the option to apply a coefficient to the prices. Allows for quantities to be exchanged between two of the structures (Budget, Sale or Study). Deletes the quantities and prices of the chosen complete price structure (Budget, Sale or Study). Generates the structure of the Sale price, the offer, based on the Study price structure. Using this tool, users can, for example, obtain an offer based on the Cost study by transferring the study price structure (Direct Expenses + Indirect Expenses) to the sale or budget structure by applying a coefficient or percentage to take into account the total expenses or the expenses which are proportional to the charge. In other words, the general structure expenses of the company plus those of the contract, including the acceptable profit and any unforeseen costs which the user wishes to consider are applied to the DE + IE. The price of the job item or modified auxiliary item (budget, sale or study) will not depend on its decomposition. At the same time, all its decomposition lines are deactivated (not eliminated), including those which can be added later on to the concept. The concept will be taken as a concept without decomposition when calculating the indirect expenses (unjustified job items), in reports and when exporting to other formats. If the Fix price option is selected, a mark will appear next to the price of the job item or auxiliary item that has been modified, and another next to the quantities of the unit items of its decomposition. If the cursor is placed on the price of the job item or auxiliary item, a text tag will appear indicating: "Fixed price (does not depend on its decomposition)". If it is placed on the quantities of the unit items, a text tag will appear indicating "Cancelled quantity". The fixed price can be unblocked using the Unblock price option, located in the contextual menu that appears on screen when the price is clicked on with the right mouse button. This option reinstates the decomposition of the job item or the auxiliary item, and so the value of the price becomes dependent on this decomposition once more. The quantities and amounts of the unit items making up the price (budget, sale or study) of the job item being modified are deactivated (take a value of zero). The concept will be taken as a concept without decomposition when calculating the indirect expenses (unjustified job items), in reports and when exporting to other formats. As the amount of the unit items is maintained, if the user introduces quantities in the decomposition, the price of the job item will once again become dependent on the decomposition. A dialogue box appears allowing the price of the decomposed price to be adjusted automatically by modifying the data of its decomposition. The concept maintains its calculated price condition in the current price structure. In the indicated dialogue, users can select the concept types of the decomposition, which are going to be altered to obtain the price adjustment. The section: Price Structure for the Job Execution Contract has also been implemented in the Project type dialogue box (Menu > Configuration > Project type). Has the same effect as the Delete job item decomposition option in previous versions. In other words, deletes all the decomposition lines of all the job items. This option allows for any of the three complete price structures to be selected (Budget, Sale and Study), even all three at the same time, so the quantities of the job items of the selected price structures are deactivated (not deleted; they take a value of zero). The following options: Increase prices, budget adjustment and Partial adjustment (Processes > Price modifications) allow for users to select the complete price structure which is going to be modified (Budget, Sale or Study). This way, different indirect expenses can be defined for the three price structures. Within this option are the rules which can be activated in a different manner for the Budget, Sale and Study price. Includes the rules which can be activated to mark incorrect prices regardless of which existing price structures are present. The Values to use as reference, which are defined in the Edit job options dialogue box (Job control > Configuration) have been adapted to be able to control and follow-up the job bearing in mind that the study has been carried out based on the Study or Budget price structure. This option is located in the contextual menu that appears when the right mouse button is clicked on the (budget, sale or study) price or cost field of a job item with decomposition. The price of the selected concept becomes editable data, and so no longer depends on its decomposition. At the same time, all its decomposition lines are deactivated (not deleted), including those which can be added later on to the concept. The concept will not be considered in the same way as one that does not have a decomposition for when calculating the indirect expenses (unjustified job items), in reports and when exporting to other formats. If a price is fixed using this option, a mark will appear next to the price of the job item or auxiliary item that has been modified, and another next to the quantities of the unit items of its decomposition. If the cursor is placed on the price of the job item or auxiliary item, a text tag will appear "Fixed price (does not depend on its decomposition)". If it is placed on the quantities of the unit items, a text tag will appear indicating "Deactivated quantity". The fixed price can be unblocked using the Unblock price option, located in the contextual menu that appears on screen after having fixed the price, and is detailed in the following point. This option is the same option that appears in the dialogue box when the Price field is modified, and has been explained in detail in the Modification of the budget price, sale price and study price in job items or auxiliary prices with decomposition section of this webpage. This option is located in the contextual menu that appears when the right mouse button is clicked on the (budget, sale or study) price or cost field of a job item with a fixed price. This option unblocks the fixed price so it can be recalculated in accordance with the decomposition contained in the price structure to which it belongs. This option is located in the contextual menu that appears when the right mouse button is clicked on any field of any job item. This option already existed in previous versions. When selected, the Change of data revision marks of a job item dialogue box opens. The 2013.e version includes two new revision marks for job items: With sale quantity pending revision and With study quantity pending revision. Opens a dialogue box in which a list can be included of all the decomposed concepts for which the price has been fixed in the price structures selected within it. How to fix a price and what this implies are explained in the New options in contextual menus section and Modification of the budget price, sale price and study price in job items or auxiliary prices with decomposition section of this web-page. Prices can also be fixed in the Concept list window using the new option: Fix decomposed concept price, details of which are provided in this section. This option includes all the concepts whose data updating process has been blocked using the new option: Block data update, details of which are provided in this section. This option opens a dialogue box in which the price can be fixed of all the decomposed concepts contained in the list belonging to price structures selected within it. Fixed prices will not be recalculated even if their decomposition is modified. The effects of fixing a price are explained in the New options in contextual menus section and Modification of the budget price, sale price and study price in job items or auxiliary prices with decomposition section of this web-page. This option opens a dialogue box in which users can unblock the fixed prices of all the decomposed concepts contained in the list belonging to price structures selected within it. This way, the prices will be recalculated in accordance with their decompositions. This option will mark all the concepts contained in the list so they are not updated during any data update processes from other databases or from the Price Generator. This option unblocks all the concepts in the list whose data update is blocked. Two options: Sale quantity and Study quantity have been implemented in the drop-down menu that appears in the quantity and certification detail zones. A new option: Used price structures, has been included in the Data menu of the Report template editor (File > Edit report templates > select a template). This option opens a dialogue box that contains a series of configuration options. If the template uses a specific price structure and users wish for the deactivated or cancelled information for that price structure to not be printed in the report, it can be done using these configuration options without the need of having to use scripts. Arquimedes has been updated to adapt changes introduced in ArhiCAD 16 (32-bit) and maintain the connection between both applications.